In Box Series as background for fashion magazine! Plus....all sorts of art related things are always happening at Gallery 80808/Vista Studio...like poetry readings and fashion shoots! Wink, a new on-line magazine, shot both their fashion layout at Gallery 80808/Vista Studios....and covered Skate and Create, the exhibition Steve and I sponsored! Read the magazine here! This past week has been full of inspiration. 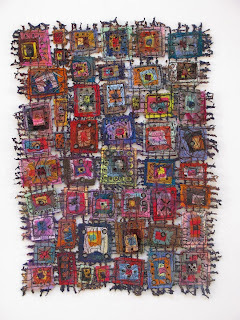 It started out with a presentation at the Crooked Creek Art Guild. I brought my Embellisher and plenty of "stuff". 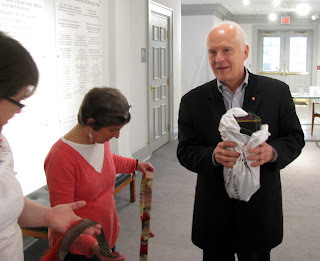 Everyone got to try....making a fiber bookmark. It was a blast. 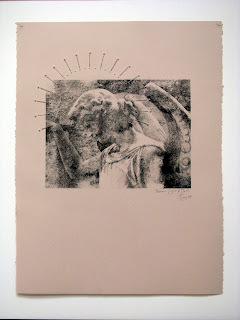 During the week I worked on several projects, finishing three new pieces in my Angels in Mourning Series. 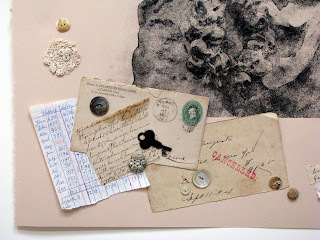 I'm really enjoying the process of arranging vintage scraps of lace and hand written letters with old canceled stamps, pieces of costume jewelry, keys to unknown locks, eyeglass lens, and other ephemera that suggests lives in past times and the various things left for future generations. 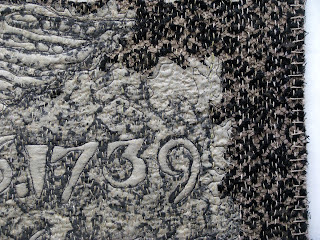 Stitching through the printmaking paper is easy but must be very precise. I have lots of ideas for the future images too. 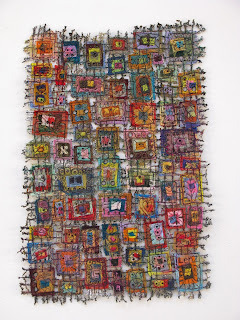 On Saturday I attended Talking Threads, a quilt and fiber arts symposium at the Sumter Gallery of Art. The first speaker was Dr. Marlene O'Bryant Seabrook of Charleston. 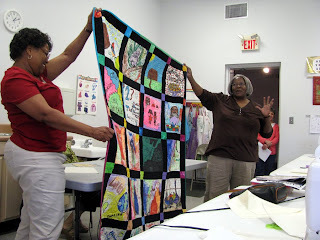 Because she lives so close, she opted to present a "trunk show" and brought many of her quilts, especially those stressing her concept of education through quilting. I never got a good photo of the second speaker, Laural Horton, a folklorist and internationally renown quilt researcher. Her presentation was great. 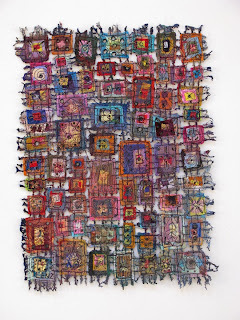 It focused on the the innovations that are continually happening in the process of traditional art making through the ages. She was excellent. 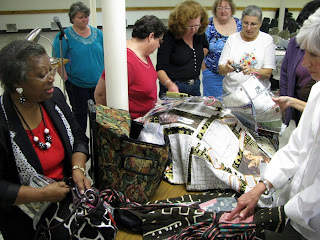 Gustina Atlas, right, formerly of Mississippi but recently relocated to Denton, Texas, conducted a workshop on string quilting. It was fun. 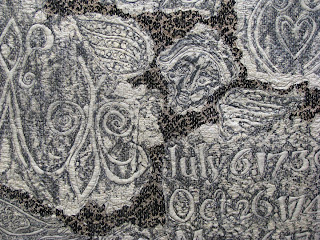 Although I've been creating grave rubbing quilts now for one year and three weeks (to be exact! 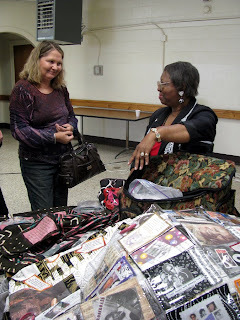 ), my knowledge and abilities in traditional quilting are limited.....and likely to remain so! 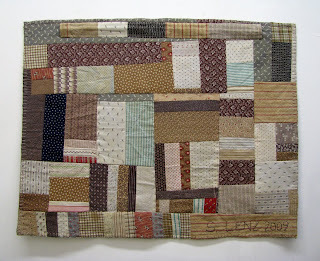 Thus, I really enjoyed the simplicity and ease of "string quilting". 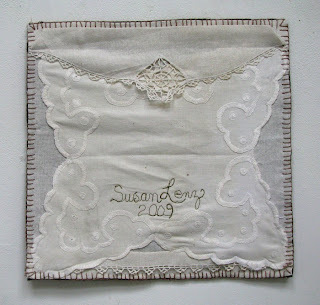 Recently I've been fighting the urge to just quickly and randomly stitch together scraps of vintage linens. I just didn't know how to effectively do this....until now! 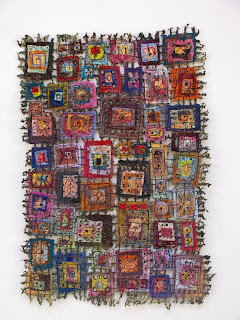 The final speaker was Jon Eric Riis, the internationally great tapestry artist whose work I've admired countless times in several venues, including the Textile Museum and Renwick in DC; the Museum of Craft and Design in NYC; and gracing the pages of Fiberarts Magazine, etc. To hear him present his own life's work was a real treat. He is so gracious, kind, and generous with his time. It was my honor to simply be in his presence....but it was my privilege to actually TOUCH the two pieces he brought with him! 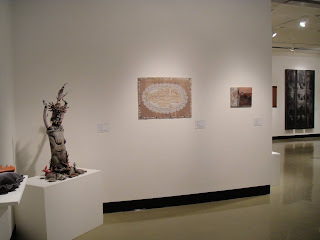 The entire symposium was one event associated with the exhibition on display at the Sumter Gallery of Art. Tradition/Innovation: American Masterpieces of Southern Craft and Traditional Art is an excellent show. The signage addressed many important issues, including the history of both traditional and studio craft in the South, the affects of culture and location on craft techniques and ideas, and the ways in which tradition is modified by innovation as well as the foundation of tradition for contemporary exploration. 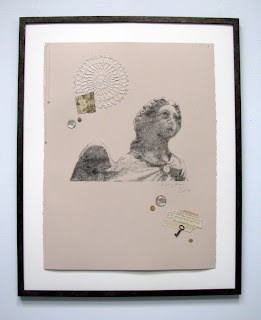 Easily, my favorite piece was Portal to Portal by Shawne Major of Louisiana. 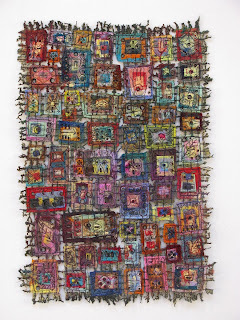 It is massive(88" x 60"), fun, well made, and speaks volumes about obsessive stitching, a consumer society, and the fragments of life. I LOVE THIS! It was created in 2005. Finally....we have a new "rescue cat". 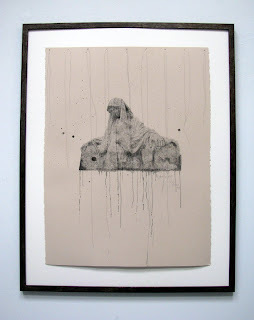 My artistic mentor Stephen Chesley....who has a solo show opening later this week at Gallery 80808/Vista Studios (Article written by another friend, Jeffrey Day, is HERE. 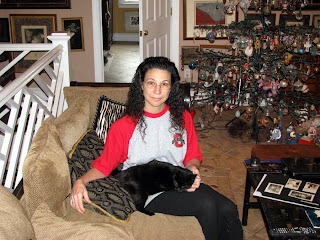 )...helped rescue several cats and kittens. 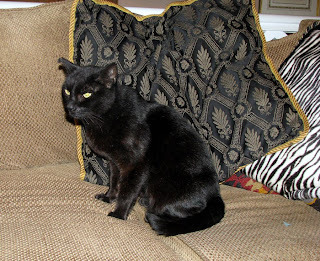 We agree to take the older, female cat.....because she's totally black......just like Shadow, our cat who's been alone for over a year now. They aren't friends yet, but we are hopeful. We've named her Sissy because, well, it suits her. Most days she's under the sales counter. She terrified of everything, very timid, but purrs like an engine once she feels safe. She had already been spayed when found. We have a feeling that she'd been a house cat that was unceremoniously dumped when owners moved. She been bitten (jagged ear) and is still very under weight, but gaining. My weekend started on Friday with a trip to the Grovewood Gallery in Asheville. Although I've been a BRAND NEW ARTIST in this fabulous retail center for about a month, this was my first time inside the place. (My husband Steve made the first delivery of my work.) Meeting the knowledgeable staff was great. Bringing new, requested work was fantastic. Looking at all the breath-taking artwork while knowing that mine was among such talent brought tears to my eyes. I am SO PROUD! We bought two cereal bowls to celebrate! 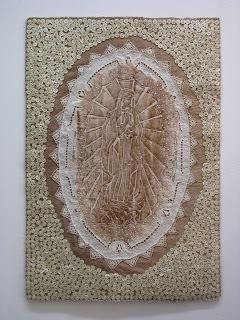 While riding in the car, I started stitching on another Grave Rubbing Quilt....because The Virgin of Guadalupe was in my studio in the last stage of completion. The final blanket hole edging was done on Saturday. I'm thrilled with the buttons....a recent purchase at the local auction house. There's hundreds, maybe thousands, more just like these; all for five dollars! 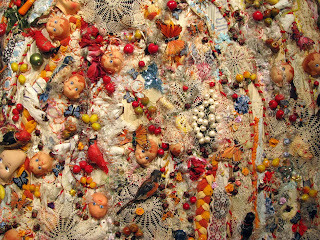 (Above: The Virgin of Guadalupe, detail. 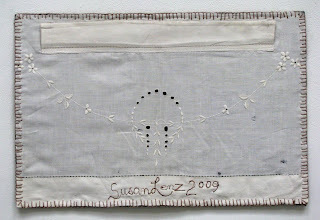 Below: Reverse of The Virgin of Guadalupe. Click on either image to enlarge. 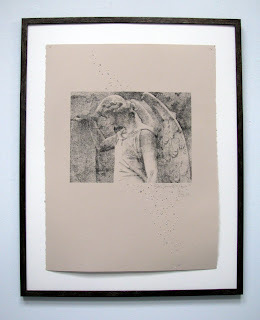 Finally, the "Angels in Mourning Series" is underway. I've been thinking about them; "hunting and gathering" things for them; listing potential titles; and even blogging about them. The first one was finished and posted on September 2 (Here!) Yet, the stack of xylene transferred cemetery images were set aside....until now! Evidently, more mental "peculating" was needed but now progress! It's been wet, rainy, and unseasonably chilly here in South Carolina recently. 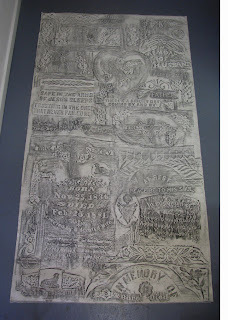 I worried that the best time to create two large panels/curtains of grave rubbings had past. My plan was to go to the nearby cemetery on Sunday. Well, the sun came out, the temperature rose, and the grass in this section (not perpetual care) was even cut! The chunky black crayons I bought and misplaced in my studio were found. It was a glorious several hours alone composing these two pieces. I have a unique idea for how they'll function in next February's solo show! 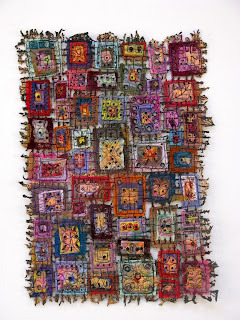 Each panel is 48" x 7 1/2 feet. I also reaped another wonderful harvest of artificial flowers from the commercial sized dumpster at the back of the main section of the cemetery! They have all been disassembled and washed. As if all this wasn't enough, I received the photo below from my fiber friend Jill Rumoshosky Werner. 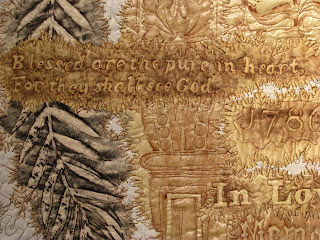 It includes 18th Century Angel, Grave Rubbing Art Quilt in a very, very nice hanging location in the Wichita National All Media Craft Exhibition 2009. Jill lives in Kansas, went to the show, took the photo, and has her piece featured on the cover of the catalog! Congratulations and many, many thanks, Jill! Earlier this summer Steve and I visited our elder son Mathias and his girlfriend who dance for Birmingham Royal Ballet. The company was on tour to Manchester, England. 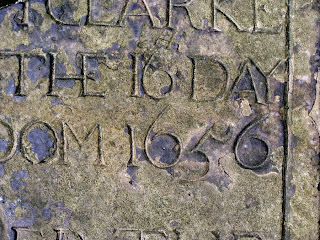 A short MetroLink ride brought us to the little town of Eccles and to St. Mary the Virgin Parish Church where I found mid 16th and 17th century gravestones. 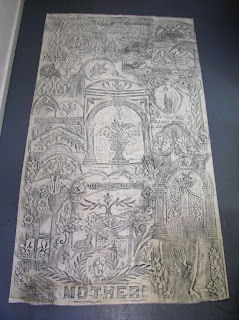 I made several rubbings. 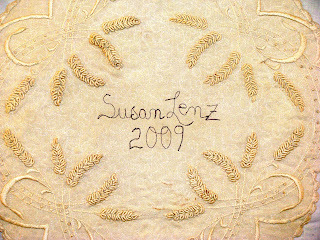 Since then I've designed two art quilts using this unique fabric. This is the first of the two completed. 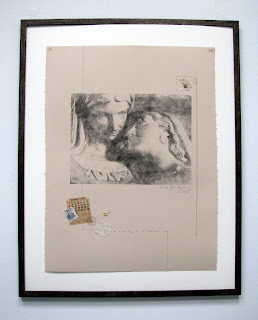 This is the first in the series to be called by the location from which the rubbing came. Since I actually have two from this place, I'll have to come up with another name for the second one. 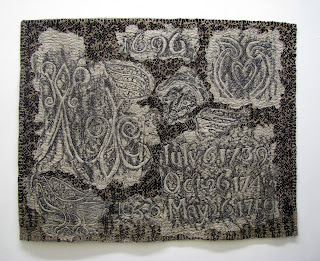 Mentioning "names", I want to thank everyone for the great ideas for the recently "untitled" grave rubbing art quilt. I decided to go with Greatfully Dead....a suggestion made by my friend Margaret Neville who owns the local paint-it-yourself ceramic studio, The Mad Platter, and who is in my Artist's Way group. Thanks Margaret. Mentioning, Julia Cameron's The Artist's Way.....this is a wonderful book. It really isn't a book to "read"; it is a book to "live". 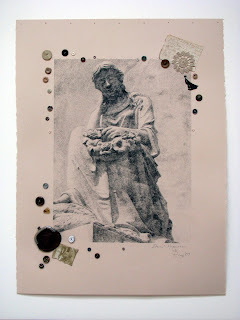 About five years ago I participated in another Artist's Way group. It changed my life! After the experience, I could admit that I really "was an artist". My creative journey really started then....and ever since has been aided every step of the way. This time around, I'm facilitating the group....which honestly doesn't mean much. Now into our ninth week, I don't do anything except say, "Well, what did you think of this chapter?" The group pretty much keeps the conversation going while covering each section. One of the other people in the group is Carol Endres. Carol is ALL OVER THE INTERNET. 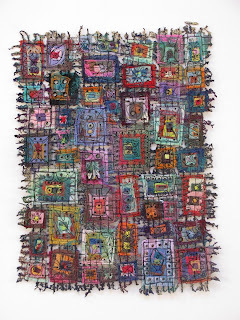 After years of working as a successful, commercial artist designing wallpaper, calendars, folk art gifts, rug designs, items for the home and gift market, etc., Carol has moved to Columbia in pursuit of personal art interests. 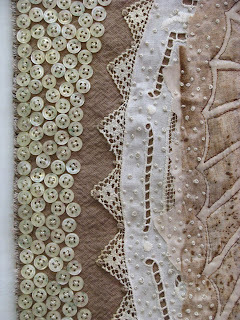 She gave me a collection of vintage quilt scraps last week. 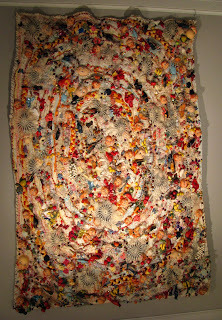 Most of the pieces still had frayed seams from a former quilt. 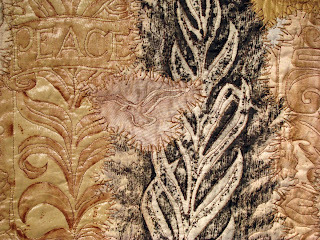 Without much planning, pinning, or eye on design, I patch-worked almost all the pieces into the back for Eccles. 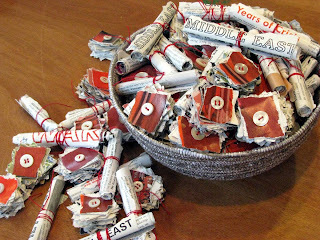 I really love recycling old, beloved material. It feels like adding a piece of history to the mix of ages. 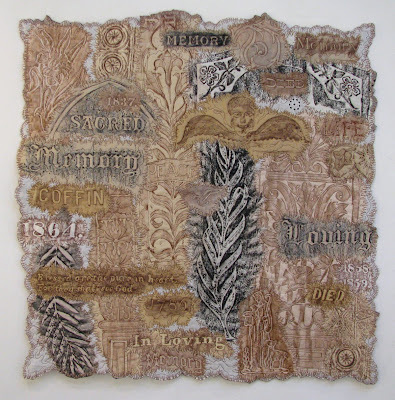 This art quilt includes rubbings from the 17th and 18th centuries, lace and some quilt scraps from the 19th century, more quilt scraps and a recycled curtain from the 20th century, and handwork from the 21st century! 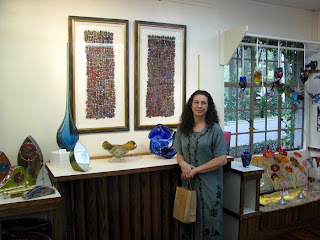 Just last month I was accepted as a new artist at Grovewood Gallery in Asheville. My husband Steve delivered the first pieces. One sold on the very first day! In fact, a couple of pieces have sold since then. I was called with a request for more art! Specifically, more of my smaller "In Box Series" pieces! So....I'm going to Asheville with these eight new works. It will be the first time I've actually been to the gallery! I'm so excited. As a professional artist, I have mixed up and totally conflicted emotions about entering the state fair. Many laugh, saying that state fairs aren't the "right" sort of venue for quality work. I've been advised not to include any mention of a state fair prize on my resume. Embarrassingly, I admit to heeding this advice; but, I LOVE STATE FAIRS! My creative journey started at the Ohio State Fair years ago....while browsing through the aisles in the arts and crafts building....innocently saying, "Oh, I could do that....and I could stitch this"....and my husband Steve wisely commenting, "Put your money where your mouth is!" The Ohio State Fair was the first event into which I ever submitted anything. It was important. It was thrilling. 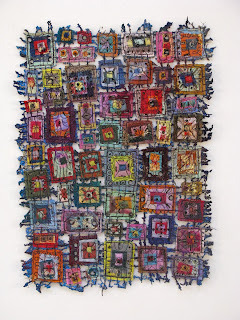 It opened my eyes to the possibilities of needle and thread. 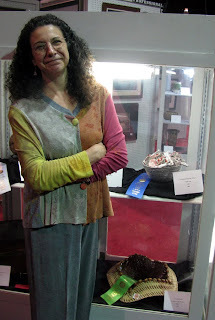 Once we moved to South Carolina, I attended the fair here...and entered cross stitch and needlepoint...and won awards...and finally got up the courage to try "fine art" as an "amateur"...and then, about eight years ago...I entered as a "professional". I've won several awards since then, including another first place in my division. Truly, state fairs are significant to my development as a working artist. It was a great evening. I am very, very happy to be a winner. I'm not going to put it on my resume and I feel guilty about this. So....how do others feel about State Fairs? 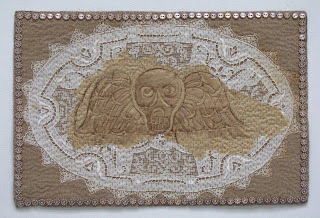 Two More Miniature Grave Rubbing Quilts....One Needs a Title! 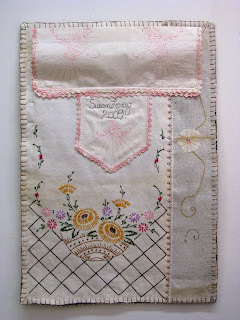 These are the two additional, miniature Grave Rubbing Art Quilts that I did the hand stitching on while traveling. 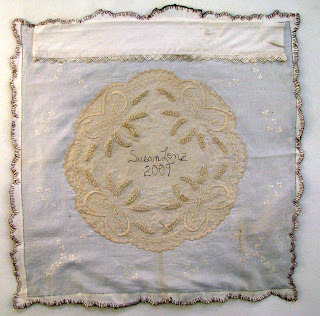 The free motion machine embroidery, buttons, and backing were created once I returned home. For both I used some of the buttons purchased abroad. 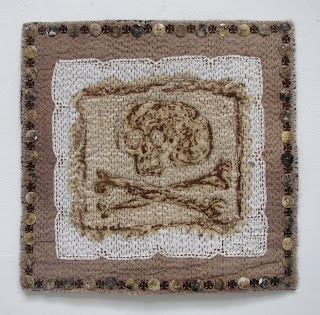 One is called Skull and Crossbones (which is a bid more morbid than I intended but seems "right"). The other one is "nameless". I know the image looks like "The Angel of Death" but I'd like to entertain some other name. 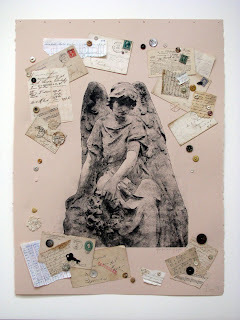 These art quilts, the hanging chiffon banners of epitaphs, and the Angel in Mourning Series (works on paper) aren't really about DEATH. 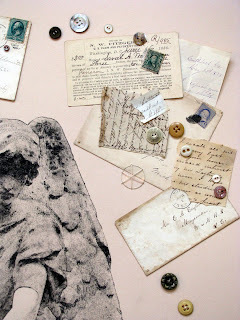 They are meant to focus on the passing of time, our human desire to leave a mark on earth, and our connection to those who came before us as well as those who will come afterward. 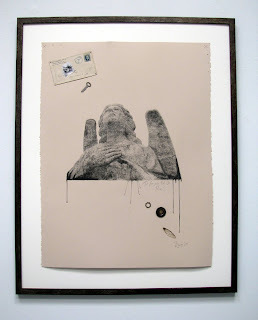 This series is meant to investigate the concept of memory, of life, and the time we each have left. I hope the work triggers ideas for more fully engaging every precious day. So....I need some other title for this piece....please help!